Amazon updates Fire TV Stick with new Alexa voice remote | What Hi-Fi? 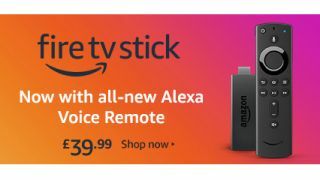 From January 23rd, Amazon will be bundling its Fire TV Stick with the all-new Alexa voice remote, which was launched last year and already comes bundled with the 4K HDR-supporting Amazon Fire TV Stick 4K. The device can be pre-ordered now. The new remote adds new power and volume buttons for greater control over your TV, and by long-pressing its microphone button you can take advantage of most of Alexa's commands – including ordering pizza and getting a weather forecast. The inclusion won't be hoisting up the price of the Stick, either - it will remain £39.99. Amazon Fire TV Stick 4K vs Apple TV 4K: which is better? The remote has been available to purchase separately on Amazon for £29.99, however until January 28th Amazon is discounting it by 50 per cent. It's compatible with Fire TV Stick (2nd Gen), Fire TV Stick 4K and Fire TV (3rd Gen, pendant design). The bundling of the latest Alexa remote certainly makes the Fire TV Stick even more appealing for those looking for a budget video streamer, however we'd still urge those wanting in on the 4K HDR streaming action to spend a tenner more for the 4K Stick.